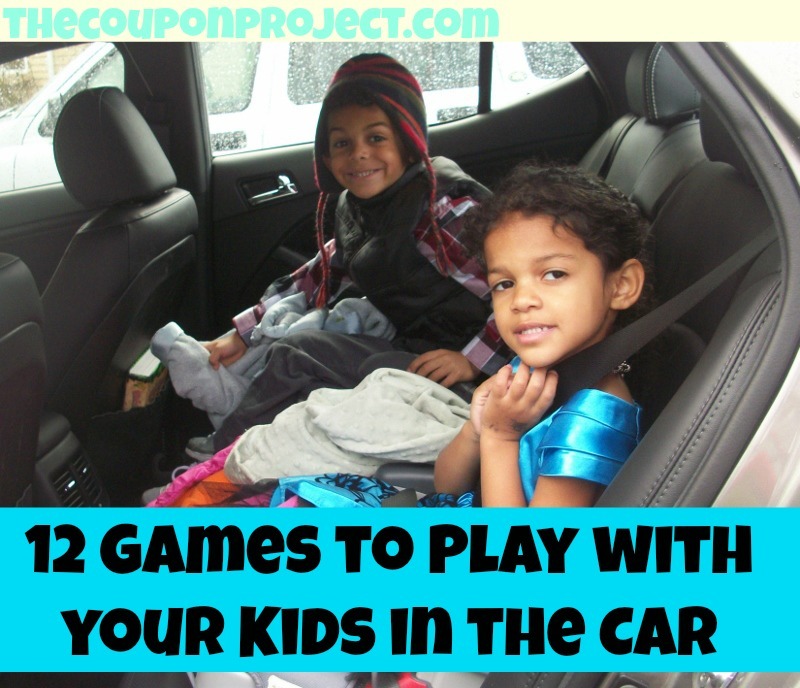 My kids frequently ask me to come up with a game while waiting in line or driving in the car. As you can imagine, I can’t whip up any supplies, so I just have to use my imagination. I thought I’d share my list so you could keep it handy the next time you’re looking to keep your kids occupied! 1. I’m thinking of _____________. There are many variations to this game. Each person takes a turn thinking of something that the others have to guess by asking questions. You could have them give a couple clues to start, or not. Some versions we’ve played before include I’m thinking of a place, I’m thinking of a Disney princess, I’m thinking of a food, and I’m thinking of an animal. 2. Opposites. The opposite of short is tall and the opposite of big is small, but what’s the opposite of a hippopotamus or the Tacoma Dome? Have everyone describe the object you’re trying to find the opposite of first – for example, the Tacoma Dome is big, round, and blue. Next, think of something that would be the opposite of that (so small, flat, and not blue). There are no wrong or right answers and everyone can play together. Keeping with the Tacoma Dome example, the opposite could be a toothpick or a piece of paper or a spaghetti noodle. 3. Sing a song. I made this one up in the car the other day and the kids wanted to play it even after we got home! Start by having one person come up with something that someone else has to make a song about. For instance, I might say “swimming pool” and now my son has to sing a song about that. When he’s done, he has to come up with something sister had to sing a song about. 4. Joint story. This is a great one because you can make it as long or short as you want! Start by telling just part of a story, and then have the next person tell the next part. Cut them off, and have the next person tell the next part, and so on. If this is a bit beyond your kids’ age level, have them give you a few characters (Superman, Mommy, and your pet lizard) and a place (Disneyland) and invent a story using their suggestions. A bedtime favorite in our house. 5. Count to 1,000. Believe it or not, we actually did count to 1,000 once in our household, but we divided it up among a few car rides! If your kid is able to do this on their own, even better! Based on my experience, it should take them roughly 40-50 minutes to complete. 6. Describe. My son made this one up a few weeks ago, and it’s another one that everyone can participate as a team. Start by coming up with an object and have everyone say as much can be said about that object. For instance, “describe a wheel” might be – they are round, they are on vehicles, they can be different colors, they can be different sizes, they help people move, etc. 7. Name that tune. Pretty much exactly what you think! Take turns humming bits of songs and have people guess. Of course, we have some variations too. You can try clapping the rhythm to make it trickier to guess. My daughter also likes to play a version where she sings soooo quietly it’s really anyone’s guess what she’s singing. 8. I Spy. Sure you’ve played this with your kids while waiting in line at the store, but have you ever tried playing it in the car? Try it. It’s not easy since everything is racing by – you have to be quick! You could also do a variation where you try to find as many fire hydrants as possible, or grocery stores, or Hondas (my kids’ favorite; don’t ask why!). 9. Alphabet Spy Game. Here’s perhaps a better version of the “I Spy” game for the car. Have everyone look out their window and find something that starts with the letter “A”, then “B”, and so on. You could work together as a team, or wait until everyone found their own “A” item before moving onto B. 10. Alphabet Games. The alphabet has lots of possibilities for games! About a month ago, my son and I played Star Wars ABCs in the car, which he loved! Anankin, Boba Fett, Clone Wars, Droid, etc. You could also do places, foods, animals, kids’ names, etc. 11. OK or not OK. Admittedly, this one has an object lesson to it – so I love playing this one as much as the kids do! I’ll describe a scenario and they have to decide if it’s “OK” or “NOT OK.” For example: “you see a kid that looks a little different at your school and some kids are saying some mean things about him – OK or not OK?” I then try to get them to explain why it’s OK or not OK. If it’s not OK, I may also ask, “so how would you handle that situation differently?” This game always brings up some great conversations around respecting one another, kindness, and diversity. 12. It’s a good day for…, it’s a bad day for… My daughter loves this one, and it’s a good one for the younger set! Start by observing the weather – is it rainy and cold? Sunny? Snowy? Then, have your kid make the statement: “it’s a good day for” and fill in the blank. For instance, if it’s raining it would be a good day for staying indoors and reading. Then, have them finish the statement “It’s a bad day for.” Naturally these can be as silly as you like (keeping with the example above, a rainy day could be a bad day for running through the sprinkler in your bathing suit). I hope sharing some of these ideas will get you started the next time your child is saying they are bored or you’re faced with a monstrous line at the post office or a 1-hour car ride to see grandma. Can you suggest another fun game to my list? Please leave a comment below! We live quite a distance outside of the closest city so every drive for us is a LONG drive. I have two boys aged 2 and 5 and I’m sure we’ll all be thanking you for this list soon! I’ve been reading this blog for at least a year and I have been inspired by so many of your gardening and money saving ideas, thanks for all you do! Love it – thank you Christina! If you guys end up coming with any variations or additional games, please feel free to come back and leave a comment! The 2nd game didn’t have a name but was played like this: one person would say a word (any word they wanted). The next person had to come up with a new word that started with the last letter of the previous word. For example: my daughter would say “butterfly”, then my son would say “yellow”, then I would say “whale”, etc. You’d be amazed how long that can entertain the kids! Oh your comment made me think of something…. I had to institute a rule for our games. No “butts” or “poop” etc. It’s amazing how when left to their own devices any game will start to head down that path lightening quick! Thank you so much for your input. I am definitely going to try that 2nd one with my kids the next chance I get. That sounds one that would be right up their alley! My kids reminded me that the second game includes a category. So think of a category, say it’s animals, then each word they think of has to fit into that category. Hope you enjoy the game as much as we do. We love to play Skittles. There is a color master. The job of this person is to name the colors. Everyone else looks for a car that is that color. When you find it you yell skittles. Then a new color is picked. Sometimes we say stripes, or logos, or dark green, bright blue etc. Chiggichiggy is yelled out when you find a Volkswagen Beattle, better the punch buggy. Old style bugs are worth 10 points, convertibles are worth 5, sun roofs are worth 3, all others are worth 1, or all are worth the same. The quiet game is my sons favorite! Whoever can be quiet the longest wins. 3, 2, 1, Quiet! Only two time outs per person and no humming, or noises at all! We also play the light stop game. Every green light is worth a point, red lights subtract a point, yellow lights are a free pass. No points. We also do I spy, and we are always on the lookout for an out of state license plate. We have a USA map that we pin with places we have visited and license plates we have seen. You start at A like the alphabet does and then you name your name “Allison” your husband name “Andrew” were you come from “Annapolis” what you sell “ants” and then you can take turns doing that on the order of the alphabet and it keeps the kids busy and laughing its fun to see what they come up with excpecaily the young ones (haha) and you can try it multiple times with different challenges like a name we have not said in any of the other games. MY GRAND KIDS ARE 9 AND 12 AND THEY LOVE PLAYING A GAME WE MADE UP. iF YOU WERE GOING ON A PLANE TO THE TROPICS WHAT WOULD YOU PACK OR TO A COLD COUNTRY OR CAMPING OR WHATEVER YOU CAN THINK OF. we TAKE TURNS THINKING OF SOMETHING. YOU HAD LOTS OF GOOD IDEAS – WE ARE GOING TO TRY THEM OUT. i ALSO MADE PICTURE BINGO AND WORD BINGO AND MADE COPIES AND PUT CLEAR MACTAC OVER IT TO PROTECT THE PAPER THEN THEY USE WIPE OFF MARKERS.